View of the ruins of Easby Abbey in Yorkshire. A religious community was established here in c.1155 by the Constable of Richmond Castle. It was a community of Premonstratensian Canons, who unlike monks, had a specific vocation to spent time preaching to and serving to the lay community. 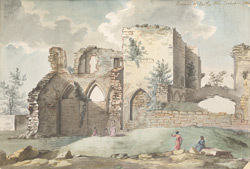 The abbey was built in the attractive Swale Valley, making it one of the more picturesque Yorkshire monastic ruins. The hilly lie of the land meant that it had an unconventional layout - for example there was no regular four sided cloister. Unlike other monastic ruins, no abbey church survives here but there is an impressive refectory building.